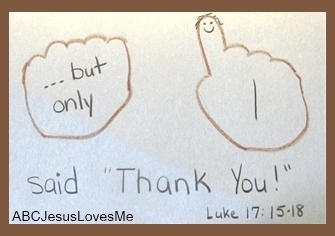 Is there someone whom you need to say "thank you" to? Verse: Psalm 118:1 (NIV) - Give thanks to the Lord for He is good. - Paint The Thankful Leper worksheet with a mixture of corn syrup (very little needed), water, and food coloring. Find a box and fill it full of things that you are thankful for (i.e. plastic food, a shoe, paper money). Add to it as the week goes by. At the end of the week, have a "Thankful" party with a "Thank You" cake to God for all of the blessings in your life. Create a maze throughout the house with yarn. Add zigzag and wavy lines. Along the maze at different intervals, tie three bows on the yarn. Have the child walk along the yarn and stop every time he comes to a bow. Have him repeat the memory verse at each bow. Then say one thing that you are thankful for. With your family or a group, go through the alphabet and create a list of items that you are thankful for. Have the child write the first letter of each word. Try to stick to phonetic beginning sounds. Trace around the child's hand or paint and stamp a handprint. Show all 10 fingers for the first page and only one finger for the second page. 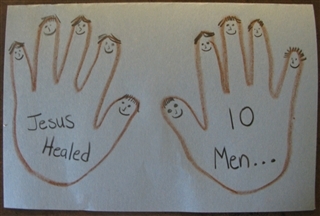 Add the title "Jesus healed 10 men... ...but only 1 said "Thank You!" Luke 17:11-19"
This version is very similar to the original rules except there is not limit to the amount of tiles in a row. In this game, there is no competition or winner as each person is simply sorting and adding tiles to the sequence. Have each player draws six squares. Choose a person to go first. The first player lays down a row of tiles that are the same in color or shape. After playing, draw the amount of tiles laid so that each player always has six squares. The second player adds to the existing line or creates a branch off of the original line. The game continues until everyone is out of tiles. This game is more difficult because the player must look at each direction of the row to make sure the tiles fit. Bath Sponges are the easiest tool for a child to wash her body. To give you child ownership in hygiene take a fun trip to the store and allow your child to pick out her own sponge and soap. Role play with a doll how to correctly wash her face, ears, arms, armpits, stomach, legs, feet and private areas. Add a little soap to the sponge and teach the child to work from the top of the body down to her toes. Most preschoolers are not able to self-wash their hair until in elementary school, but start now helping the child rub the shampoo throughout her hair. - Teach the child to start with the sheet. Find the top corner and pull up. Repeat with the other corner. Do the same with the blanket and comforter. Finish by placing the pillow on the bed. - Points of Grace: It is much harder to make a bed when the blankets are not tucked in well at the bottom of the bed or when the bed is against the wall. Bunk beds are hard for to make even adults! Give grace for a bed that is well attempted but not perfect! Use the Tt Writing worksheet and for further learning check out the Letter T Activities. Write numbers 10-15 on 3/4" Tracing Paper. - A good story consists of a good plot. The plot is the action in the story. By listing the major events, you are summarizing the book. - Create a timeline making simple pictures of the major events of the story. 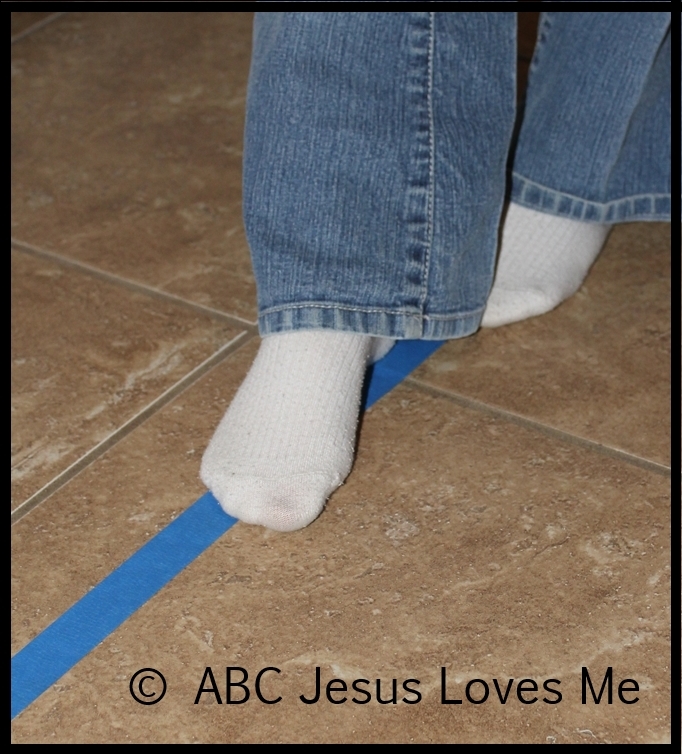 Demonstrate this activity for the child. - Create a list of the major events in the book. - Review the Me of the Map activities in Week 8. Discuss what is means to be a town mouse vs. a country mouse. Discuss why life would be different (sounds, smells, sights, etc.) in the town vs. the country. - Make a chart of positives and negatives for both the town and the country. Use ideas from the book as well as your own.